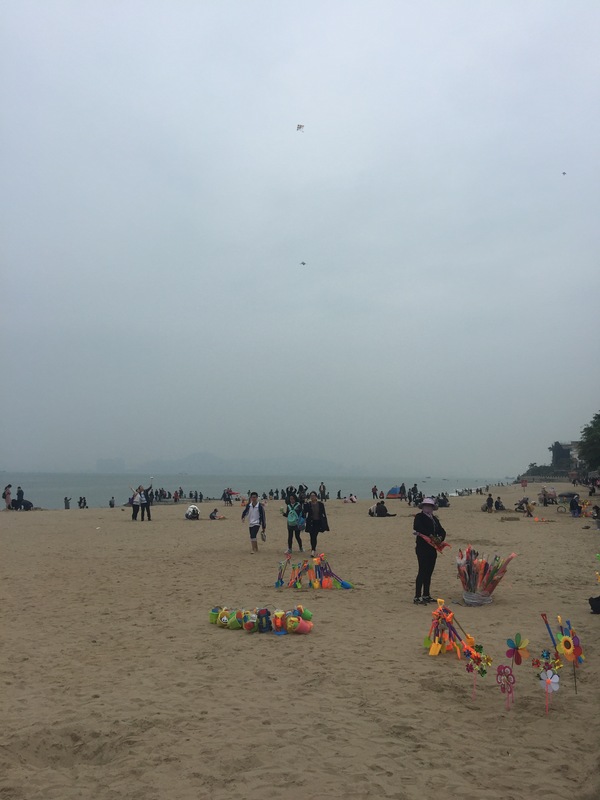 We left Wuyi Mountain and after a long day travelling by bus and a train we arrived in Xiamen in the evening – opting for an early night as we were due up early to explore the city of Xiamen. It was a city Mike and I had never heard of but it turned out to be a pleasant surprise. On the coast, the city held a trove of treasures from temples to beaches, to quaint islands to explore. We started by visiting a large Buddhist temple. While we had visited many in India and lots in Myanmar, this was Chinese Buddhist which was slightly different. The temple backed onto a mountain and had a lake in the front. The first thing we noticed was a giant smiling fat Buddha at the entrance. This image of Buddha we hadn’t really seen in the temples we had visited this far, surprising as it is probably the most famous in western culture, in fact we have one in our garden. There were also many more images of guardians and elaborate displays of Buddha with many arms and weapons. 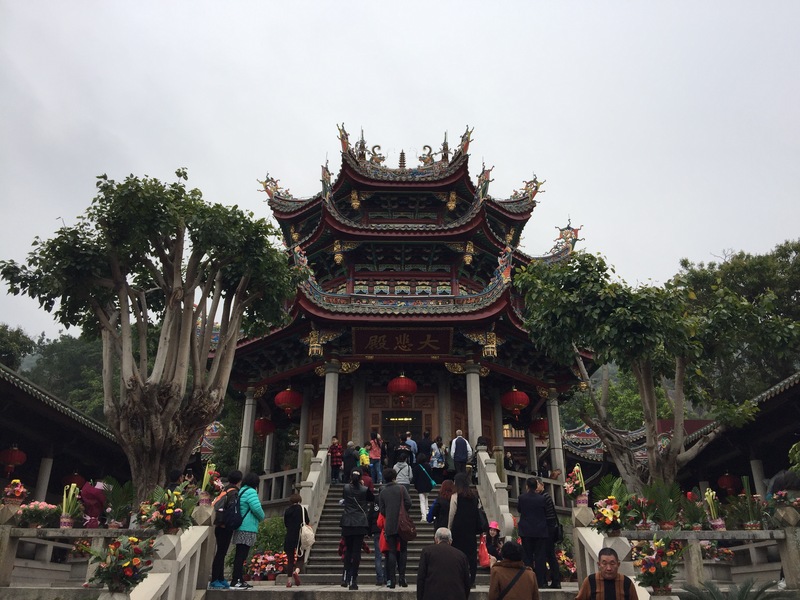 The temple complex was pretty and included traditional Chinese architecture. As the temple backed onto a mountain (large hill really) we hiked to the top. If didn’t take more than 20 minutes and were greeted with views of the city and temple below. On the top was a local fast food restaurant built on an old gun emplacement. The city used to be ruled by the British and the hill must of provided a good defensive position. The temple was also next door to a famous Chinese university. Asking our guide why it was a famous he replied because it has beautiful landscape. Not because it is famous for a particular subject, he said students come here to enjoy the landscape and will probably end up doing their serious study abroad. After a giggle we walked around the university lake and grounds and some rare black swans swam in the lake. For the lunch the group vetoed Chinese and we went for pizza instead. Bellies full we visited the beach next. The beach which was a bus ride away was like any other beach. We walked along the promenade and took in the fresh sea air. Next we headed for a small island off of the coast called Gulangyu. It used to be home to consulates from different countries during its colonial times. The bus ride there took an hour as we had to go to the international ferry port rather than the local one, apparently this is to limit the number of tourists to protect the island. Once we landed we walked around the street food market. Lots of freebies were on offer, from dried fruits to squid. Lots of different sea food could be seen in tanks and bowls on the street, many which we would never eat in the UK. 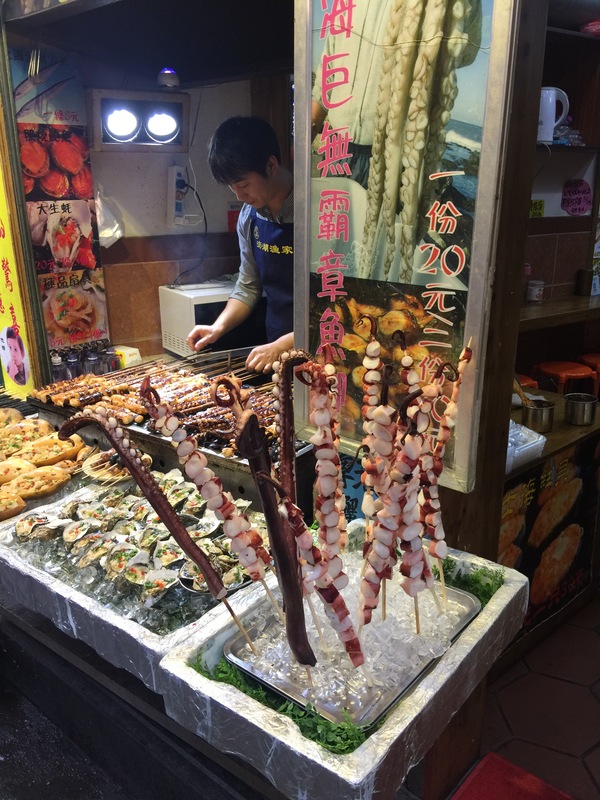 Mike had a skewer of squid and kept eyeballing the giant waffle ice creams. After the market we walked around the island looking at the colonial architecture and went for a couple of over priced drinks. We took the ferry back and a taxi to the hotel having enjoyed our day around Xiamen. Next stop was a rural Chinese village.